This is a book I almost dread to read every month. I buy it for a couple reasons, I love Spider-Man, and I love Team Up books. And when Spider-Man AND Team Up are in the same title! Well, you just gotta buy it! Anywho, when I saw the creative team on this issue, I did get excited. I like Kevin Shinicks writing and I absolutely love Marco Checchetto's art. So let's stop wasting time and see what's inside this juicy book. Another quiet New York day, and Spider-Man is swinging around this quiet town. The peace and quiet is cut short though when someone starts shooting at Spidey! We learn that it's Frank Castle, The Punisher. Last time he went toe to toe with Spider-Ock, he lost. Apparently, he's been trying to get Spider-Man's attention and Spidey hasn't responded. Enter: DareDevil! The last time we saw these three together was the crossover even The Omega Effect. 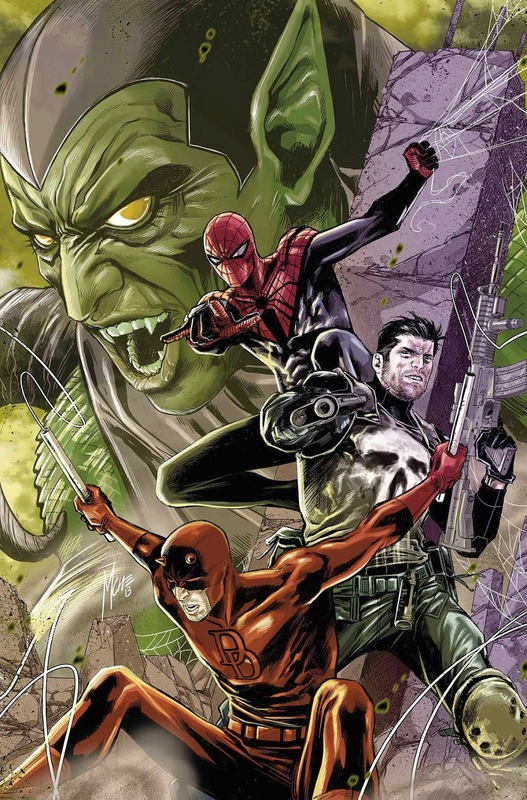 It tied together Avenging Spider-Man, DareDevil and The Punisher. Great story, you should all check it out! Anywho, DD knows that Spidey hasn't been himself lately but his senses tell him that he's still himself. It seems like everyone is on to the spider but no one can squash him. DareDevil tells them that he feels something coming and he needs help, so Spider-Man decides to take both of them to Spider-Island the headquarters of Spider-Man and where he has stashed all the weapons he's stolen from bad guys throughout his year as Spider-Man. While inside, the group is attacked by a pumpkin bomb and the entire weapons room is empty, Spider-Man's been robbed!!! DareDevil helps find the lackey with the fast pulse, as he would be the traitor in Spider-Man's ranks and they find him with ease...and multiple pumpkin bombs strapped to his chest! He's talking to someone elsewhere through an earpiece, asking for a sign or a signal to set the bombs off. This guy is serious about hurting a lot of people. Can't tell you who's pulling those strings though, you'll have to read this one for yourselves to find that out. A smoke bomb and a flash bomb later, Spider-Man finally gets his hands on the guy and he threatens our hero. There's an army coming for him, his own! His entire army has turned against him now! This book was much better than I expected. Partly for the creative team, and partly because this is building up the final arc of Superior Spider-Man with a huge war coming to the streets of New York. The build up is killing me!!! Be back soon, as I'm more than sure a couple more of these books for this story are going to end up on my review list. Until then, happy reading!